In response to the recent surge in migrants crossing the Mediterranean—and the deaths and injuries that often result from failed journeys—European policymakers have struggled to find effective policy responses to stem the flow of boats. 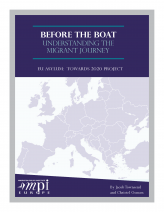 Deep, sophisticated insight into the decision-making process of those who undertake these journeys is necessary; without this information and a wider understanding of the political economy of migrant smuggling, policymakers essentially are making decisions in the dark. This MPI Europe report argues that to develop effective policy in this area, policymakers must recognize the driving forces behind migrants’ decisions and movements through a comprehensive understanding of smuggling networks and the migrants who utilize them. At the moment, the knowledge base suffers from a number of limitations, including a "destination bias" that views developments from a destination-country perspective. There is a lack of understanding of the way migrants make decisions, as their personal risk assessment models are often much more nuanced and far-sighted than the current evidence acknowledges. Policymakers should also consider the structure and economy of smuggling networks, which could help locate weak spots and pressure points. The report, drawing from the authors' interviews with migrants, highlights gaps in evidence on migrants’ decision-making processes, perceptions of risk, and access to information. It also examines smuggling networks, which have been thus far overlooked in research efforts.